In Philadelphia, a 24-hour vigil protested the pending Senate bill threatening millions with loss of health care. 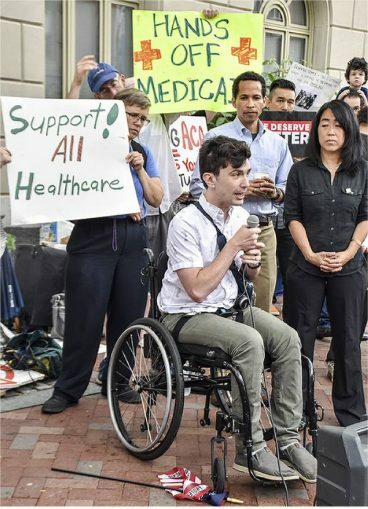 Over 200 demonstrators participated in a June 22 rally in Philadelphia against massive cuts to the Affordable Care Act and Medicaid being planned by Congress and the Trump administration. There were speeches by the Rev. Dr. William Barber II, a leader of the North Carolina Moral Mondays civil rights protest movement; Philadelphians Organized to Witness, Empower & Rebuild (POWER) leader Rev. Greg Holston; and a number of speakers who will be negatively impacted by threatened loss of health care coverage. Then a 24-hour vigil began in front of the offices of Pennsylvania Sen. Pat Toomey (R), one of 13 senators responsible for writing the Senate bill. The event was organized by the Pennsylvania Health Access Network. The Senate leadership is secretly negotiating the bill to repeal ACA that would end coverage for 23 million people and permanently slash funds to Medicaid. It would also give even more power to insurance companies, allowing them to charge more to older people and those with pre-existing conditions. Medicaid funding cuts will disproportionately affect seniors, children, low-income adults and people with disabilities. Health care is a human right. It should be free for all!